In my first post in an incredibly long time, I thought I'd forward this interesting article from India. 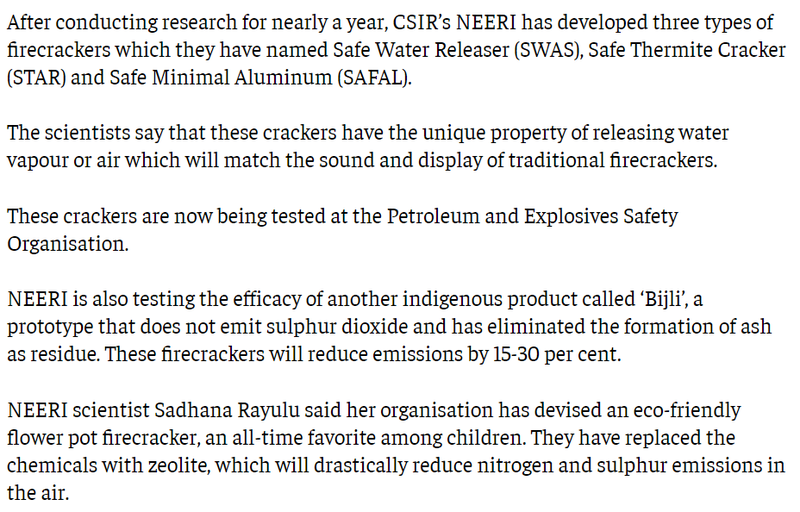 As India is a very heavily populated place and fireworks are ignited in great quantity during Diwali, it's perfectly understandable they would take the initiative to try and reduce air pollution where perhaps those of us in less densely populated countries would take our air for granted. Edited by MDH, 23 February 2019 - 02:26 AM. Interesting that they want to replace active chemicals with zeolite an inert rock with suspicions of being like asbestos and associated with a high incidence of malignant mesothelioma, a life-threatening disease also associated with inhalation of asbestos particles. Hi I am new to the forum and hope that my post is in the right area. Please let me know if I have breached protocol. Thanks for the post. Shame they don't give more information about eco friendly alternatives. Interesting point that the alternatives might be problematic in a different way. On a related subject EU changes (subject of course to Brexit) to the EPP licence in a couple of years may make using KP and KClO3 a thing of the past for hobbyists and if Barium salts and Perchlorates (is this all perchlorates including Ammonium?) are deemed environmentally unacceptable we will need some new ways of producing colours fairly soon. I know there is work on Boron Carbide and various Sr compounds for red and green (and possibly colours between) but are any of them viable in terms of practical use ie cost, efficacy and availability? I know that Lloyd has produced colours commercially using nitrates as the sole oxidisers (and assume that must be with treated Mg or maybe MgAl?) He has said that he is commercially constrained from sharing these at present. Any ideas or info would be gratefully received. Environmentally friendly pyrotechnics as they are now are less an issue of what we know will produce results, a more a matter of industrial feasibility - think long-term storage, stability and affordability. Nitrogen rich pyrotechnic fuels, for instance, are excellent light producers, but are not cheap. If you go to google scholar you can explore many journals dedicated to pyrotechnics, propellants and energetic materials which concern environmentally friendly pyrotechnics. Refine the search results to research published within the last five years and use specific names of the agent you want to explore. There is work being done all over in many little areas that will cumulatively change fireworks. My personal opinion is that as more research is conducted on the long term impacts of repeated fireworks displays (especially from theme parks, outdoor public event spaces), the more likely it is fireworks companies will be forced to adapt, and soon the industry standard will not include perchlorates or heavy metals in any substantial quantity. Edited by MDH, 05 April 2019 - 11:25 PM.